Despite what you see in some diet books and TV programmes, healthy eating really can be straightforward. A diet based on starchy foods such as chapatis, rice, bajra and jowar to name a few; with plenty of fruit and vegetables; some protein-rich foods such as lentils, fish and eggs; some milk and dairy foods; and not too much fat, salt or sugar, will give you all the nutrients you need. That means many of us are eating more than we need, and should eat less. And it's not just food: some drinks can also be high in calories. 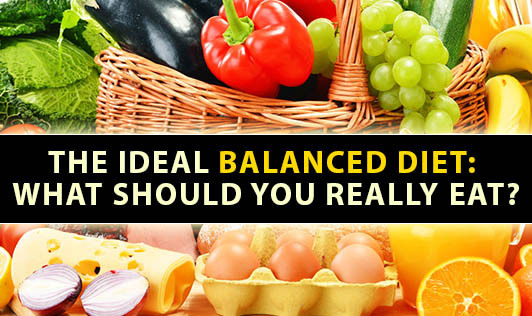 Most adults need to eat and drink fewer calories in order to lose weight, even if they already eat a balanced diet. Having a sliced banana with your morning cereal is a quick way to get one portion. Swap your mid-morning biscuit for an orange, and add a side salad to your lunch. Have a portion of vegetables with dinner, and snack on dried fruit in the evening to reach your five a day. Potatoes are a great source of fiber. Leave the skins on where possible to keep in more of the fiber and vitamins. For example, when having boiled potatoes or a jacket potato, eat the skin too. Try to choose wholegrain or whole meal varieties of starchy foods, such as brown rice, whole wheat pasta and brown, whole meal or higher fiber white bread. They contain more fiber (often referred to as "roughage"), and usually more vitamins and minerals than white varieties. Saturated fat is found in foods such as cheese, sausages, butter, cakes, biscuits and pies. Too much saturated fat, can raise our cholesterol, putting us at increased risk of heart disease. Try to cut down on foods that are high in saturated fat and have smaller amounts of foods that are rich in unsaturated fat instead. For a healthy choice, use just a small amount of vegetable oil or reduced fat spread instead of butter or ghee. When having meat, choose lean cuts and cut off any visible fat. Sugar occurs naturally in foods such as fruit and milk, but we don't need to cut down on these types of foods. Sugar is also added to lots of foods and drinks such as sugary fizzy drinks, cakes, biscuits, chocolate, pastries, ice cream and jam. It's also contained in some ready-made savory foods such as pasta sauces and baked beans.